Bales of discarded Christmas trees were dropped in the Bayou Sauvage National Wildlife Refuge on Thursday. In an annual tradition stretching back more than two decades, on Thursday the National Guard and the U.S. Fish and Wildlife Service teamed up to drop nearly 10,000 spent Christmas trees into a New Orleans wildlife refuge. Apparently, it’s all for the good of the ecosystem. The “Christmas Tree Drop” may sound like some kind of portmanteau of a Christmas and a New Years’ celebration, but it’s actually a key strategy for building ecological resilience within the Bayou Sauvage National Wildlife Refuge, a 25,000-acre patchwork of marshlands, lagoons and bayous located within the city of New Orleans that’s habitat for some 340 species of birds. As refuge manager Shelley Stiaes explained to Earther, bundles of dead Christmas trees can be strategically placed in the freshwater ecosystem to absorb the energy of waves, reducing shoreline erosion. 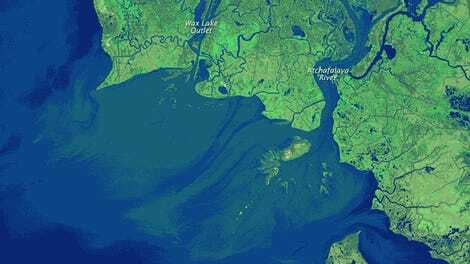 That’s a boon to the people of New Orleans, who depend on their imperiled marshes—the state of Louisiana loses a roughly a football field of wetlands every hour to subsidence and rising sea levels—to absorb floodwaters from storms. The trees also create a stable platform on which new plants can grow, and by slowing waves and trapping silt, they help keep the water clear. This allows more sunlight to reach submerged vegetation, which in turn helps the waterfoul that nosh on these plants. 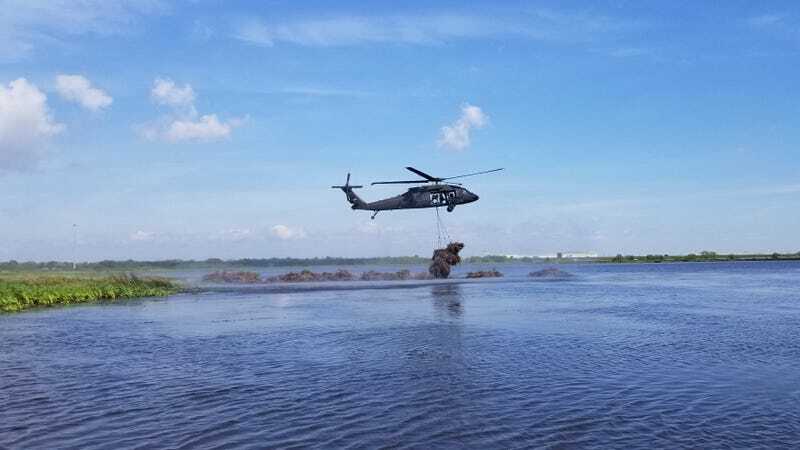 Getting the Christmas trees to the refuge also offers the Louisiana Army National Guard “a valuable training exercise,” notes FWS on its website. As Stiaes explained, the city will typically advertise a tree pickup shortly after Christmas. Folks have to put their trees out on specific days “as naked as the day you bought them”, and over a matter of several days they are picked up and brought to a central location for bundling. Trees are bundled into groups of about 60 to 75, and, on the day of the operation, the National Guard uses helicopters to airlift groups of bundles to a pre-determined drop site. After they’re plopped in the water, officials on air boats swoop in to remove the harnesses used to deliver them. This year’s tree drop “went great” Sitaes said, with the crew jettisoning about 9,900 spent trees into the wetland. (The number varies from year to year depending on public participation in the donation program.) “Everybody came back and nobody got hurt,” she went on, adding that FWS is “always concerned about injuries”, which seems all too reasonable when one is slinging giant bundles of tree trunks through the air. Folks are finding all sorts of ways to repurpose old Christmas trees, and that’s a good thing: When these piney conifers wind up in landfills, their decomposition contribute to emissions of methane, a potent greenhouse gas. For some, the alternative is to buy a fake tree, but whether those are really better for the environment is up for debate. If you live in New Orleans at least, the environmental choice is a bit more straightforward. You can’t drop a plastic tree in a wildlife refuge, after all.